The object of Dolphin Cash is to obtain a winning symbol combination by spinning the reels. A standard 5 reel online video slot game from Playtech with some really tasty bonus features. The game offers 2 different bonus rounds. 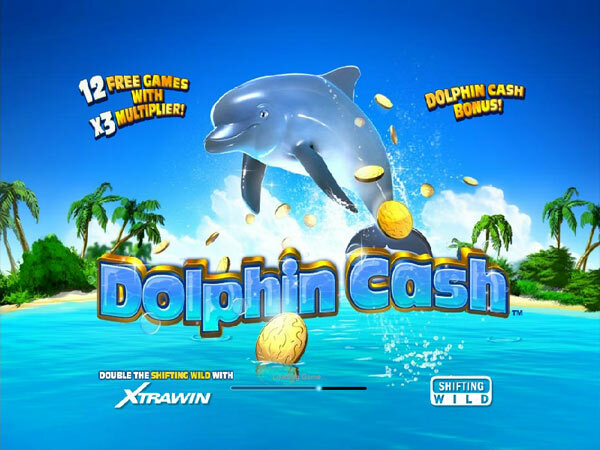 In the first game the dolphin will jump in the air to collect coins and win you a cash prize. Another bonus feature is the shifting wild. The dolphin wil appearing on reel 5 will shift 1 reel to the left with every subsequent spin until it reaches reel 1. This give a sticky wild shifting through the reels. 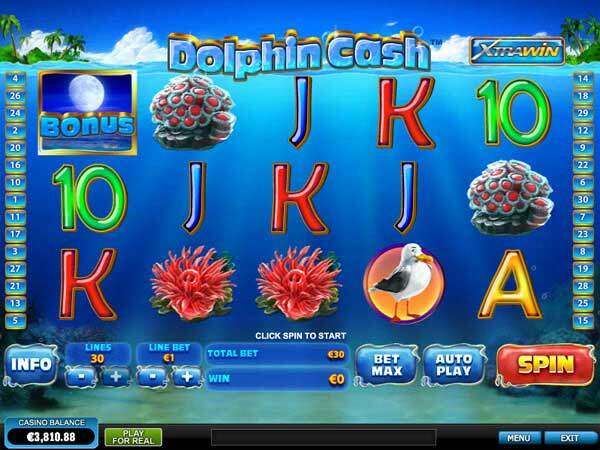 There is also the DOLPHIN CASH bonus which happens when you get 3 or more scattered dolphin cash symbols. This will lauch the FREE GAMES mode and give 12 free spins with 3x multiplier. Choose your coin size by clicking the + and � buttons on the right of the screen. Choose your line bet by clicking the Bet Per Line button. Each click adds a coin to the line bet. Once you�ve reached the maximum amount, clicking the button again will reset the line bet to one coin. Choose your paylines. You can click the Select Lines button to add a payline, or use the coloured buttons on both sides of the reels. Whenever you select a higher payline, you�ll also select all the lower ones (i.e., if you activate payline 18, paylines 1 through 17 will be active as well). You can also click Bet Max to activate all the paylines and spin the reels. The amount of money you bet on a game round is the line bet multiplied by the number of active paylines. Click Spin (if you did not press Bet Max) to spin the reels. If the reels show a winning combination after they stop (along a payline you bet on), you win according to the winning table. Click the Paytable button to see the paytable, if you wish. Close the paytable by clicking the Paytable button again. If you win on multiple paylines simultaneously, your winnings are added up. Active paylines are represented by lines that appear over the reels. You can activate paylines and see their shape by progressively clicking the Select Linesbutton. Please note: You only win if a combination occurs on an active payline. The Scatter symbol is an exception to that rule. Read more about the Scatter symbol below. Please note: There is a difference between the line bet and the total bet. The line bet shows how much you're betting on a single payline. The total bet shows how much you're spending in this game round. The payouts shown in the paytable are multiplied by the line bet, not by the total bet. If you get winning combinations on more than one payline, the winnings for each payline are added up.